These are our current limited time only, special offers. We can help you and your family save! EVERYONE SHOULD HAVE HEALTHY TEETH AND GUMS. For a limited time we are offering an examination and clean for the LOW price of $170. This includes x-rays (if required). It’s time to get that checkup you’ve been putting off! 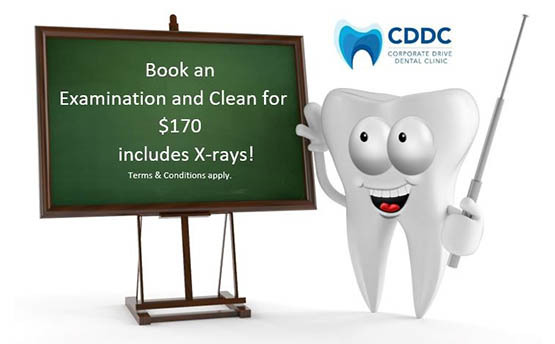 Corporate Drive Dental Clinic reserves the right to change these terms and conditions at anytime. LOOKING FOR SCHOOL HOLIDAYS ACTIVITIES? Are you stumped finding fun and educational things for the kids over the school holidays? How about a trip to the dentist! 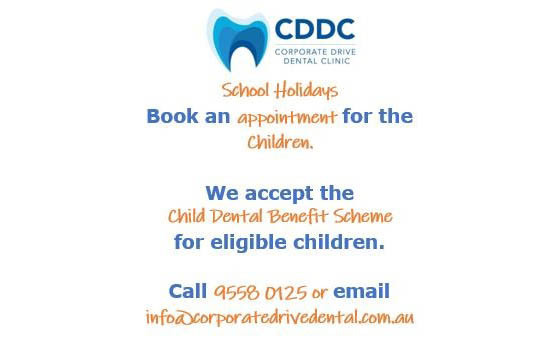 We accept the Child Dental Benefit Scheme for eligible children, and wait times for appointments during the day tend to be shorter. There’s no holiday for dental health!